Published: Dec. 30, 2018 at 04:46 p.m. 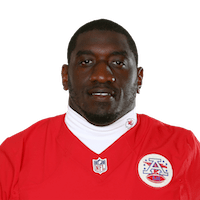 Published: Dec. 9, 2018 at 02:52 p.m.
Chiefs defensive line chops down Gus Edwards just short on fourth-and-one. Published: Dec. 2, 2018 at 05:16 p.m.
Kansas City Chiefs defensive lineman Allen Bailey scores on a fumble by Los Angeles Rams quarterback Jared Goff.